Ontech Systems provides efficient, reliable IT support services to Waukesha based businesses as well as the Greater Milwaukee area. As Waukesha IT consultants, over the last 10 years our 98% client retention rate speaks to the level of satisfaction clients experience with Ontech Systems. Since 2004, we have provided comprehensive technical solutions for small and medium-sized businesses in Waukesha, Brookfield and the Greater Milwaukee area. By partnering with industry leaders like Microsoft, Trend Micro and Cisco, we provide our clients with the most up to date solutions on the market. Ontech can work in tandem with your existing in-house IT staff or act as your dedicated IT consulting firm. Our clients primarily use us for installing new solutions such as software and network hardware, and for ongoing IT support such as managed IT, on-site and/or remote support, troubleshooting and maintenance. Whether you need managed IT services, virtualization or data recovery solutions for your Waukesha area business, with one of the highest client retention rates in the IT industry, Ontech can provide the best solutions that fit your needs and budget. Why choose Ontech Systems over other Waukesha IT Consultants? Technical jargon can be overwhelming to the average business owner. You know your business and we know your network. Our skilled technicians will clearly explain what they are doing and why they are doing it -staying away from technical jargon. Expect a 1 hour response time. No company can afford to lose business due to an unreliable network. That’s why during regular business hours, we respond by email or phone to your requests within 1 hour. 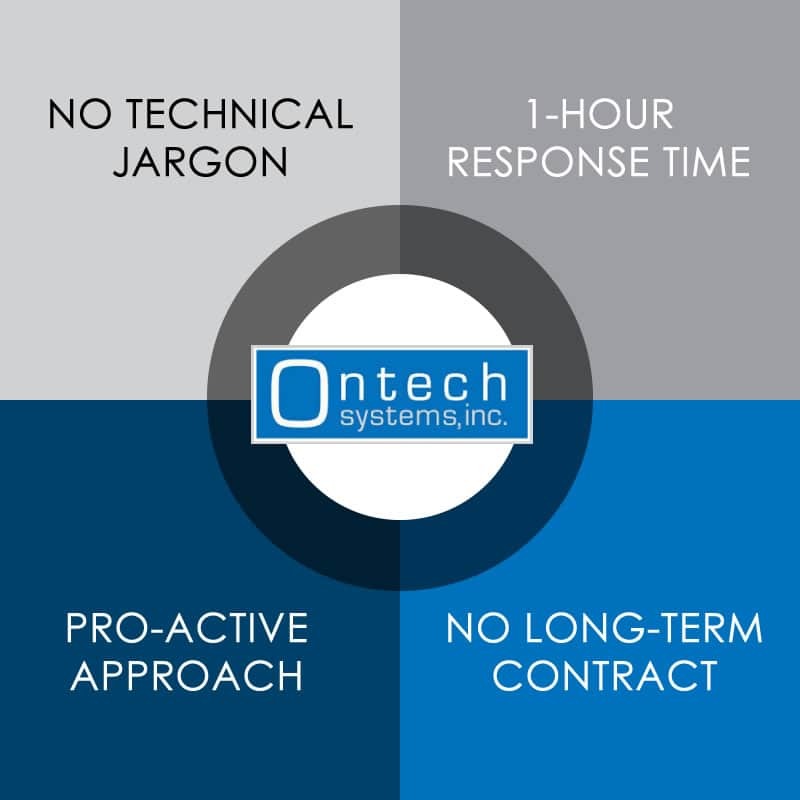 Ontech takes a proactive approach. We’re not a break/fix firm. Our technicians will work with you to integrate your overall goals and long-term growth potential into our support plan. We don’t lock clients into long term contracts because don’t have to. Our 98% client retention rate over the last 10 years speaks to the high quality IT support we provide to our clients. Or, check out what's included in a Free Network Discovery. Network Discovery includes: Audit of current network, infrastructure, server(s), PC's, backup, security performance, reliability, followed with Q&A Session with our network consultant. Please specify the issue you need assistance with. Call us at (262) 522-8560 or email us for a no-obligation, free network discovery. We will evaluate your existing network and offer ideas to improve the productivity and efficiency of your business. To begin the evaluation, our technician will audit your network and explain their findings to you in an easy-to-understand question and answer session. Before you continue your search for Waukesha IT consultants, schedule your free network discovery today. Call us at (262) 522-8560 to find out how we can help drive your costs down and bring productivity up.